The new TIF3310 IR Thermometer/ Psychrometer combines the function of a humidity meter, type-K thermocouple thermometer, and an infrared thermometer into one convenient handheld device. 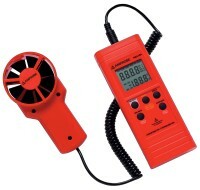 Ideal for quickly checking indoor air quality in offices, production rooms or in warehouses. Built in Infrared thermometer for non-contact temperature measurement to 932 °F with a 30:1 distance to spot ratio. Type K temperature input for contact temperature measurement to 2500 °F. Display air temperature, relative humidity, dew point and wet bulb temperatures. Highly accurate and dependable readings – within 2% RH. Rugged design that is easy to grip and hold. Large easy to view LCD display is easy to read from a distance.